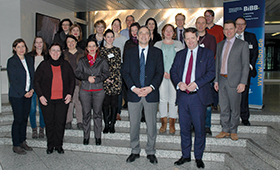 European VET experts study quality assurance in company-based education and training in the dual system in Germany. High levels of youth unemployment in many countries of the EU, particularly in Southern and Eastern Europe, and the comparatively few problems faced by the German labour market consistently generates the interest of vocational education and training experts from neighbouring countries in company-based education and training in the dual system. To support this, the German Reference Point for Quality Assurance in Vocational Training (DEQA-VET) in the BIBB has invited partners from ten other European reference points to the three-day study visit funded by the European Commission. The event is entitled “European understanding of quality assurance in work-based learning”. Attending the study visit were representatives from Finland, Greece, Italy, Croatia, the Netherlands, Romania, Slovenia, Czech Republic, Hungary and the United Kingdom. Alun Davies, the Minister for Lifelong Learning and Welsh Language, also made the journey from Wales. In his welcoming address, Prof. Dr. Reinhold Weiß, Deputy President of the BIBB commented, “Work-related learning — and certainly in a quality assured form as it occurs within dual education and training in Germany — is the key to both higher levels of employability among young people and to competitive businesses.” He continued, “The joint development and modernisation of training regulations by social partners and experts in education and training together with the key role played by the chambers in monitoring the training and in conducting examinations contribute to this success. Ensuring this and implementing further improvements in this area is an ongoing task.” The quality and attractiveness of vocational education and training represents a key challenge for Germany in view of the shortage of skilled workers and the trend towards academisation. DEQA-VET is part of the European network EQAVET – European Quality Assurance in Vocational Education and Training. The network currently has 34 member states and campaigns for the application of common principles of quality assurance in vocational education and training.